I want to share with you a website I learned about from my dad, called EPHESIANS FOUR MINISTRIES. ﻿﻿They provide tools for churches AND individuals who are interested in leadership, evangelism and/or spiritual growth. As you answer the questions, there are no right or wrong answers. Just be sure to answer the questions thinking about what you are doing NOW - not thinking about what you would LIKE to be doing. Once you submit the questionnaire, results are given immediately for you to review. If you are interested, you can also purchase additional resources that will explain more about the gifts. Speaking of spiritual gifts, even children can find out what their strongest gifts are. 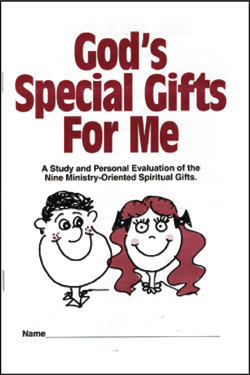 I purchased GOD'S SPECIAL GIFTS FOR ME (one booklet for each of our children) by Dr. Larry Gilbert. These booklets help introduce the 9 ministry-oriented gifts to children, and helps them see where ministering to others fits them best. The booklets are only $2.95 each (plus shipping), and are geared for ages 8-12. My plan is to begin using these in the coming school year, maybe sooner! This is the day that you have made. I will rejoice and be glad in it. May I see all the good around me today. I do not want to focus on anything negative, but on what is good and pure. Please help me focus on all your blessings today, Lord. I pray that all I think, and do, and say will be positive, will encourage others, will glorify you, and will be in your will. Thank you for the power you give through your Holy Spirit, so that I might live as you want. In Jesus' name I pray, amen. Lord, Please make me a blessing. I present myself to you, a living sacrifice, for ministry to the world. I pray that I would see others through your eyes of love and concern and that I would ask myself "What would Jesus do?" Please forgive me of the times I have been selfish or apathetic, for the times I have missed out on the opportunity to minister and be a blessing. I pray for all the people in my family and community who need a blessing right now. I pray for Christians around the world who need your hand of blessing right now. Lord, you know the need. You are good, all the time. I pray that in your mercy, you will will reach out in the way you know best and meet those needs, uplift those spirits, bless those souls, for your glory. In Jesus name, amen. I truly hope you will take advantage of these great tools, as I am seeing more and more of a need in our churches, and among our Christian circles, to remain focused on our goal for being in this world. We are not here to attend church one day a week and then forget about the Lord the rest of the week. We are not here to spend most of our time thinking about ourselves. We ARE here to serve the Lord with GLADNESS, and glorify Him in all things. These tools - the spiritual gifts resources, the prayers, the devotionals - these are all helpful in teaching us and reminding us that our days on earth are numbered and we need to be seriously thinking about where our priorities lie. I am speaking to myself here, too! No matter how stressful life becomes, we need to remember our real reason for being here. That is why I plan on utilizing these tools from Ephesians Four Ministries, and to do my best at using the gifts God has given me in ways that are pleasing to Him. I hope you will join me.